A few posts earlier, we saw a mention of something called "black powder substitute". We will study more about this topic in today's post. Ignites very easily and burns rapidly, which may cause accidents if it happens unexpectedly. Produces a sulfur smell and a lot of residue after burning. It is hygroscopic and can absorb water from the atmosphere, which causes the powder to degrade. Needs careful handling and storage to prevent accidents. Is generally corrosive in nature, which means that firearms need to be cleaned thoroughly after use. In addition to all the above reasons, black powder also burns less efficiently than modern smokeless powders, which is why most modern firearms use smokeless powders. However, there are still quite a few black powder enthusiasts, who like to use firearms (or replica firearms) that their ancestors used in the past. Due to the unsafe nature of black powder, many areas have special regulations concerning the storage, sale and use of black powder, which makes it hard for people to buy it. This is where black powder substitutes come in. The most common black powder substitute in use today is called "Pyrodex", which was invented by the Hodgdon Powder Company in 1975. Pyrodex Powder. Click on the image to enlarge. Public domain image. Ordinary black powder can easily be ignited by impact forces, sparks or static electricity, which makes manufacturing and storing it more dangerous. In fact, the last factory manufacturing ordinary black powder in the US was closed in 1970 after an accidental explosion and new regulations came out that made many retailers reluctant to sell black powder any more. In 1975, the Hodgdon Powder Company invented the first black powder substitute: pyrodex. Ordinary black powder consists of just saltpeter (potassium nitrate), sulfur and charcoal (carbon). Pyrodex also has these three ingredients, but also contains graphite, potassium perchlorate and some other proprietary ingredients. These additional ingredients make the properties of pyrodex behave more like a smokeless powder and therefore, it is not subject to the same strict regulations of black powder. This means that pyrodex doesn't ignite as easily as black powder and can be stored and transported just like a smokeless powder, which is why many retailers sell it. Pyrodex is actually about 27.5% less dense than ordinary black powder and is more efficient than it. So how does the substitution work then? Well, when measuring ordinary black powder for muzzleloading weapons, people have always specified powder loads by weight (e.g. grains in the US, grams in most other countries), but they have usually measured it out by volume. What this means is that if a muzzleloading rifle takes (say) 100 grains of black powder as a load, the user doesn't usually actually weigh out 100 grains of powder to load into the rifle. Instead the user has a powder measuring tube, which he (or she) fills with black powder and pours that into the rifle. If the user measures the weight of the black powder from the measuring tube, it will indeed weigh 100 grains (or something close to it). When using pyrodex, the user can use the same measuring tube to measure out a quantity of pyrodex. If the user weighs the contents of the measuring tube, it will weigh around 72.5 grains, since pyrodex is less dense than black powder. However, this 72.5 grains of pyrodex burns with about the same propulsive force as 100 grains of black powder, since pyrodex is a more efficient propellant. Therefore, if the user uses the same measuring tube to measure black powder or pyrodex, one can easily be substituted for the other, without affecting the pressures generated in the rifle. This makes pyrodex a "volume equivalent powder". It must be remembered that muzzleloading weapons are commonly loaded by volume using measuring tubes, this works out great when using a volume equivalent powder like pyrodex. However, black powder cartridges are loaded by weight. Therefore, if using pyrodex instead of black powder to load a cartridge, the user must actually load a lesser weight of pyrodex to retain the same amount of propulsive force. Pyrodex powder has a similar burning sulfur smell as black powder and is also very corrosive in nature and produces about the same amount of fouling as ordinary black powder. Therefore, users need to perform the same cleaning procedures as when using normal black powder. However, since pyrodex is less susceptible to ignition, it is subject to the same regulations as smokeless powder, instead of the the much stricter regulations of black powder. 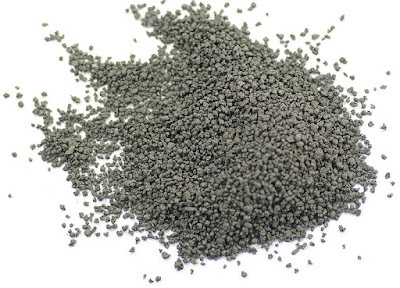 Pyrodex is normally sold in a few grain sizes: Pyrodex RS (Rifle/Shotgun), which is volume equivalent to FFg grain size black powder, and Pyrodex P (Pistol) powder, which is volume equivalent to FFFg grain size black powder. There is also Pyrodex "Select" powder, which is the largest grain size of all and is marketed as an "extremely consistent" grade of pyrodex, meant for muzzleloading rifles. 63.9 grains of Pyrodex "Select" powder have the same volume as 100 grains of black powder. Pyrodex pellets. Click on the image to enlarge. 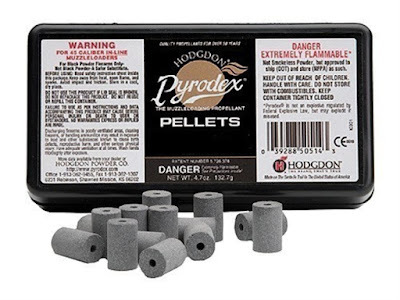 With this type of pyrodex, the user doesn't have to use a measuring tube to measure out the powder, since the pellets are all of a certain specific size. Instead the user simply takes a pellet or two and loads it directly into the firearm. We will study more about black powder substitutes in the next few posts.